This is a spin on my Salsa Verde White Chicken Enchiladas. 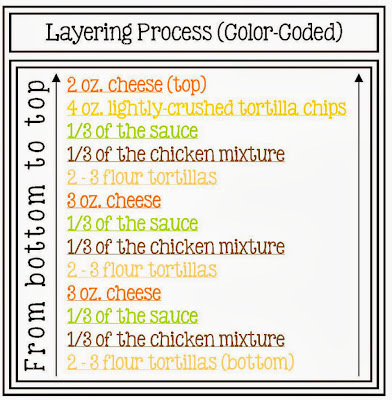 Frankly, this is an easier version since you don't have to roll the tortillas up enchilada-style. Rather, this is comparable to building a super quick lasagna ... soft tortillas stand in for lasagna noodles while the filling consists of spiced chicken, black beans and corn. And, everything is layered up with a delicious sour cream-based green salsa sauce and lots of gooey cheese. 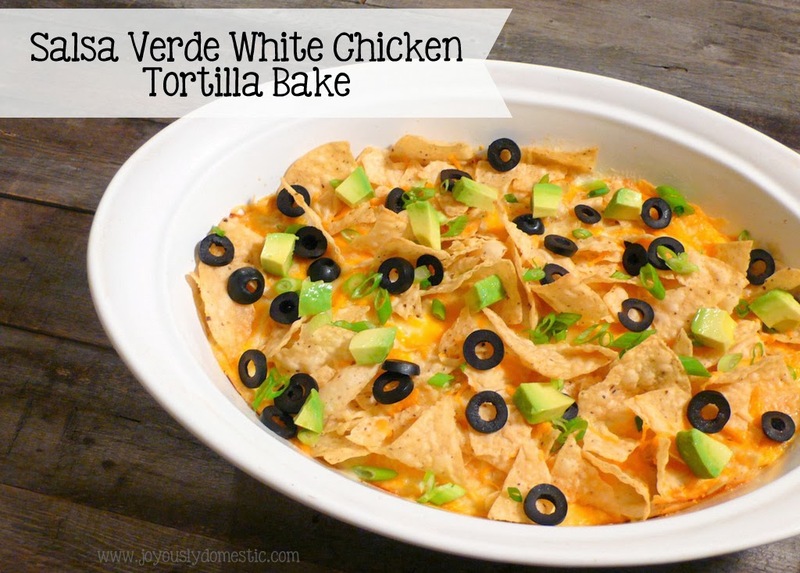 A topping of slightly-crushed tortilla chips adds the perfect "crunch" to the dish! 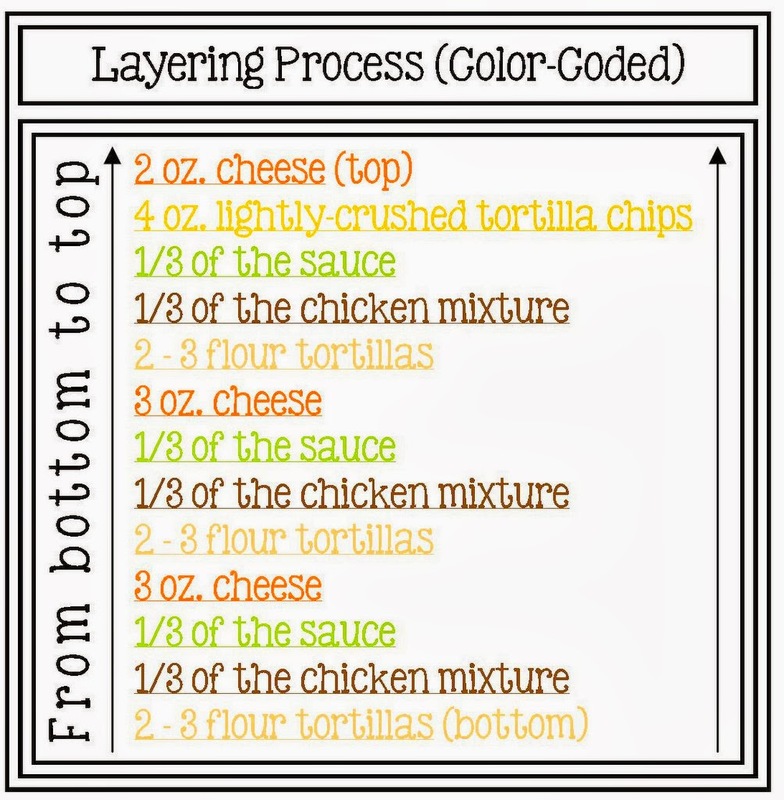 Don't bypass adding the chips ... they really "make" the dish. I prefer to use my homemade Salsa Verde in the cream sauce of this dish, but a good-quality store-bought green salsa would be just fine. In a large sauté pan set to medium heat, melt the butter. Sprinkle in the flour. Whisk occasionally while cooking for 3 - 4 minutes. Pour in chicken stock. Whisk to combine and until no flour lumps remain. Simmer until sauce begins to thicken. Turn off heat. Whisk in the sour cream and salsa. Season with salt and pepper, as needed. Set aside. In a medium mixing bowl, combine all of the chicken filling ingredients shown above. Set aside. Coat a high-sided rectangular (like, 9 x 13) or oval (mine was a 4-qt.) baking dish with non-stick spray. Notes Regarding Assemble: It's okay if the flour tortillas go up the sides a bit. They will probably need to overlap towards the middle of the dish and if using a rectangular dish, will not necessary cover the entire bottom. You can cut-to-fit, if desired. Bake uncovered for 45 - 55 minutes ... or until everything is nice and bubbly. Remove from oven and allow to rest for 15 - 20 minutes before serving so everything has a chance to set up. Top with desired garnishes.